Criccieth (Welsh: Cricieth [ˈkrɪkjɛθ]) is a town and community on the Llyn peninsula in the Eifionydd area of Gwynedd in Wales. 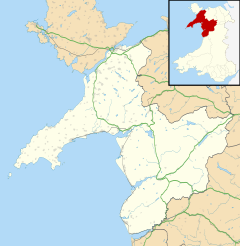 The town lies 5 miles (8 km) west of Porthmadog, 9 miles (14 km) east of Pwllheli and 17 miles (27 km) south of Caernarfon. It had a population of 1,826 in 2001, reducing to 1,753 at the 2011 census. The town is a seaside resort, popular with families. Attractions include the ruins of Criccieth Castle, which have extensive views over the town and surrounding countryside. Nearby on Ffordd Castell (Castle Way) is Cadwalader's Ice Cream Parlour, opened in 1927, whilst Stryd Fawr (High Street) has several bistro style restaurants. In the centre lies Y Maes ("The Field", or town square), part of the original medieval town common. The town is noted for its fairs, held on 23 May and 29 June every year, when large numbers of people visit the fairground and the market which spreads through many of the streets of the town. 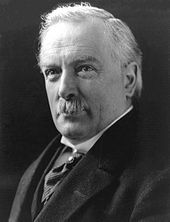 Famous people associated with the town include the British prime minister, David Lloyd George, who grew up in the nearby village of Llanystumdwy, and poet William George. Group Captain Leslie Bonnet, RAF officer, writer and originator of the Welsh Harlequin Duck and his wife Joan Hutt, artist; both lived at Ymwlch just outside Criccieth from 1949 until their deaths in 1985. Criccieth hosted the National Eisteddfod in 1975 and in 2003 was granted Fairtrade Town status. It won the Wales in Bloom competition each year from 1999 to 2004. The town styles itself the "Pearl of Wales on the Shores of Snowdonia". The earliest recorded form of the place name Criccieth in Welsh is found in Brut y Tywysogion where reference is made to the imprisonment of Gruffudd ap Llywelyn in the 'castle of Cruceith' (Middle Welsh orthography: Kastell Krukeith). The form Cruciaith was used by Iolo Goch in a famous 14th century poem addressed to Sir Hywel y Fwyall, custodian of the castle. There are a number of theories as to the meaning, but the most popular is that it comes from Crug Caeth: caeth may mean 'prisoner' and thus the name could mean prisoner's rock, a reference to the imprisonment of one of Llywelyn ab Iorwerth's sons in the castle by his brother. However, caeth has the primary meaning in Middle Welsh of 'serf[s]' and the name could refer to a bond community nearby. In later medieval times the settlement was also known as Treferthyr (martyr's town), probably a reference to Saint Catherine, after whom the parish church is named. The spelling of Criccieth remains controversial today. Many[who?] regard this version as an Anglicism, arguing that the Welsh form Cricieth should be used instead. Others argue that Criccieth is simply an anomaly in the Welsh language, in which there is no double C, and that the spelling should be preserved. The dispute has resulted in the vandalising of road signs at the entrance to the town. The area around Criccieth was settled during the Bronze Age, and a chambered tomb, Cae Dyni, survives on the coast to the east of the town; it consists of seven upright stones, and there are 13 cup marks, arranged in several groups. Evidence from other sites on the Llŷn Peninsula suggests that the area was colonised by a wave of Celtic settlers, who explored the Irish Sea, probably around the 4th century BC. Ptolemy calls the peninsula Ganganorum Promontorium (English: Peninsula of the Gangani); the Gangani were a tribe of Irish Celts, and it is thought there may have been strong and friendly links with Leinster. Although it is thought that Criccieth Castle was built around 1230 by Llywelyn ab Iorwerth, who had controlled the area since 1202, the first record of the building was in 1239, when the administrative centre of Eifionydd was moved from Dolbenmaen. In the later years of his life, Llywelyn turned his attention to his successor. Welsh law stipulated that illegitimate sons had equal rights with legitimate sons; Llywelyn sought to ensure that Dafydd ap Llywelyn, his legitimate offspring, would inherit Gwynedd in place of his eldest, but illegitimate, son Gruffydd. On Llywelyn's death in 1240, Dafydd sought to secure his position. Dafydd was half English and feared that his pure Welsh half-brother would be able to gather support to overthrow him. Gruffydd was held prisoner in Criccieth Castle, until he was handed over to Henry III of England in 1241, and moved to the Tower of London. Dafydd ap Llywelyn died in 1246, without leaving an heir, and was succeeded by Llywelyn ap Gruffudd, his nephew. 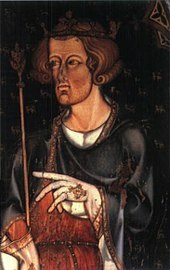 Edward I had inherited the English throne in 1272, and in 1276 declared Llywelyn a rebel. By 1277, Edward's armies had captured the Isle of Anglesey, and were encamped at Deganwy; the settlement, the Treaty of Aberconwy, forced Llywelyn to acknowledge Edward as his sovereign, and stripped him of much of his territory. Dafydd ap Gruffydd, Llywelyn's younger brother, attacked the English forces at Hawarden in 1282, setting off a widespread rebellion throughout Wales; Edward responded with a further invasion of Gwynedd, during which Llywelyn was killed on the battlefield at Cilmeri. In 1282 Criccieth Castle became part of a ring of castles surrounding Edward I's newly conquered territories in Wales. With the final defeat of Gwynedd, Edward set about consolidating his rule in Wales. Criccieth Castle was extended and reshaped, becoming one of a ring of castles surrounding Edward's newly conquered territories. A township developed to support the garrison and a charter was granted in 1284; the charter was intended to create a plantation of English burgesses who would provide food for the soldiers from the arable land behind the Dinas and the grazings on the slopes beyond. Weekly markets were held on Thursdays and there were annual fairs on 25 April and 18 October, the evangelical feasts of Saint Mark and Saint Luke. The new administration soon proved unpopular among the native Welsh, and in 1294, Madog ap Llywelyn led a national revolt against English rule. Criccieth was besieged for several months over the winter; 41 residents sought refuge within its walls, joining the garrison of 29 men under William de Leybourne, until supplies were brought in from Ireland the following April. The following year, the castle was again used as a prison, housing captives taken in Edward's wars against Scotland. Three Welshmen who had settled in the borough, which was supposedly reserved for the English, were evicted in 1337, but times were about to change. Hywel ap Gruffydd was appointed constable of the castle in 1359, the first Welshman to hold the post. The following year came mayor of the town, holding the office for twenty years; in a poem of praise, Iolo Goch described him as "a puissant knight, head of a garrison guarding the land". By 1374 eight jurymen from the borough had Welsh names. Min-y-Mor was built to take advantage of the tourist trade following the construction of the railway in 1868. Richard II was deposed and imprisoned in 1399, and died in mysterious circumstances the following year. Opposition to the new king, Henry IV, was particularly strong in Wales and Cheshire, and in 1400 serious civil unrest broke out in Chester. Henry had already declared Owain Glyndŵr, a descendant of the Princes of Powys, a traitor, and on 16 September 1400 Owain launched a revolt. He was proclaimed Prince of Wales, and within days a number of towns in the north east of Wales had been attacked. By 1401 the whole of northern and central Wales had rallied to Owain's cause, and by 1403 villages throughout the country were rising in support. English castles and manor houses fell and were occupied by Owain's supporters. Although the garrison at Criccieth Castle had been reinforced, a French fleet in the Irish Sea stopped supplies getting through, and the castle fell in the spring of 1404. The castle was sacked; its walls were torn down; and both the castle and borough were burned. The castle was never to be reoccupied, while the town was to become a small Welsh backwater, no longer involved in affairs of state. The town expanded in the 19th century with the coming of new transportation links. In 1807 a turnpike road was built from Tremadog to Porthdinllaen, which was intended to be the main port for traffic to Ireland; and with the construction of the Aberystwyth and Welsh Coast Railway in 1868, the town began to develop as a Victorian seaside resort. Criccieth solicitor David Lloyd George was elected as Liberal Member of Parliament for the Caernarfon Boroughs in 1890. He was to hold the seat for 55 years, during which he was Prime Minister from 1916 to 1922. He was renowned for his scathing wit; as one of the great reformers of the 20th century; as a wartime leader; and for the scandals that rocked his government. His position as a leading statesman was to bring Criccieth back into national and international prominence; the town still has many locations connected with Lloyd George and his family. Disaster struck Criccieth in October 1927; a great storm in the Irish Sea stopped the tidal flow, causing a double high tide. High seas and strong on-shore winds destroyed houses at Abermarchnad, the pressure of the waves punching holes through the back walls; the houses subsequently had to be demolished and the occupants rehoused. Edward I granted a charter to Criccieth in 1284, creating a borough. Criccieth became a borough under a charter granted by Edward I in 1284, and was the capital of Cantraf Eifionydd. The first mayor was William de Leybourne, who was appointed constable of the castle a month after the charter was granted. The borough was left unreformed by the Municipal Corporations Act 1835; a royal commission reported in 1876 that the corporation had long been extinct; and it was formally abolished in 1886. The Criccieth Improvement Act 1873 had created a board of improvement commissioners to govern the town, and to take over the borough's property; and from 1889 they formed a second tier of local government below Carnarfonshire County Council. Under the Local Government Act 1894 the improvement district became an urban district with a directly elected council, while the remainder of the civil parish was renamed Penllyn, and became part of Lleyn Rural District. The urban district was extended between the world wars, taking in parts of Penllyn and Treflys in 1934, followed by part of Llanystumdwy in 1938. Criccieth Urban District was abolished in 1974, and the town became part of Dwyfor District in the new county of Gwynedd, although the town retained limited powers as a community. Dwyfor itself was abolished when Gwynedd became a unitary authority in 1996. The town now forms an electoral division of Cyngor Gwynedd, electing one councillor; in 2008 Guto Rhys Tomos, an Independent, was elected. Criccieth Town Council has 12 elected members; in the 2008 elections ten Independent councillors and one representing Plaid Cymru were elected unopposed. Since 1950 Criccieth has been part of Caernarfon parliamentary constituency, and has been represented by Hywel Williams of Plaid Cymru since 2001. In the National Assembly for Wales it has since 2007 formed part of Dwyfor Meirionnydd assembly constituency, represented by Dafydd Elis-Thomas, the Presiding Officer of the assembly, and also from Plaid Cymru; the constituency forms part of the electoral region of Mid and West Wales. Gorse flowers throughout the year in Criccieth's temperate maritime climate. Criccieth is located in Eifionydd on the Cardigan Bay shore of the Llŷn Peninsula. The town is south facing and built around the rocky outcrop containing Criccieth Castle, which effectively divides the shoreline in two at this point. The East Shore has a sandy beach with a shallow area for bathing, whilst the Marine Beach, to the west, is quieter and has a number of hotels and guest houses. The rhyolitic headland on which the castle is built is strong and not easily eroded. The cliffs to each side, however, are less resistant, being made up of glacial drift, layers of boulders, stones, clay and silt which were laid down during the last ice age. Sea walls were already in existence at the time of the first Ordnance Survey map in 1891, and the west shore sea wall had been extended and groynes built by 1913. Extensive remedial work was completed in 1965, and the defences were again strengthened in 1974 and 1985. In 1995 work was started on improving the defences along The Esplanade, followed in 1997 by further work to replace the crumbling gabions below Lôn Felin. Submerged forests occur in a number of places off the Cardigan Bay coastline, including Criccieth; these are deposits of peat, soil and tree remains and appear to be post-glacial coastal lagoons and estuaries, which have been flooded by rising sea levels. The town has a temperate maritime climate which is influenced by the Gulf Stream. Frost and snow are rare; the last serious snowfall, of 6 inches (15 cm), was in 1985. The climate results in a luscious, green countryside and many delicate plant species grow wild; gorse flowers throughout the year. One plant unusual to Criccieth is lampranthus roseus, known locally as the Oxenbould Daisy and introduced in the late 19th century by a resident of Min-y-Mor. At the 2001 Census, Criccieth had a population of 1,826, of which 62.76 per cent were born in Wales, whilst 32.61 per cent were born in England. 62.54 per cent of households were owner occupied, and 25.30 per cent were in rented accommodation. In the 16th century, at the bottom of Lôn Felin stood the town's mill, powered by water from a millpond near to the present level crossing and fed from the Afon Cwrt. The herring industry was important by the 19th century, with horsedrawn carts converging on Abermarchnad to transport the catch to neighbouring villages. There was also a coal yard and other storehouses by the quay, where the Afon Cwrt enters the sea. Opposite stood a lime kiln, with lime produced both for local use and export, limestone for the kiln being unloaded from ships on the quay. At the 2001 Census 54.18 per cent of the population were in employment, while the unemployment rate stood at 3.81 per cent. The proportion retired accounted for 22.99 per cent of the inhabitants. Of those employed, 23.04 per cent worked in the wholesale and retail trades and 19.86 per cent in hotels and restaurants. Criccieth Castle dominates the town, standing on a rock overlooking Cardigan Bay. Little survives of the original building, but the outer defences are still prominent. The inner bailey contains the earliest remains, including the inner gatehouse, which has two semi-circular towers. It is thought that the original living quarters were in the south west tower, overlooking the sea, and that the square north tower supported a catapult. To the south of Y Maes stands Caffi Cwrt, an early 18th century detached stone house where the burgesses held court when rain prevented them meeting in their usual location on the bridge. The house has been owned by just two families since 1729. Two medieval strip fields to the rear, Llain Fawr (large strip) and Llain Bella (furthest strip), formed most of the smallholding of Cwrt but were lost when the railway was built. Nearby, where the slate shop now stands, was a smithy. Criccieth Lifeboat Station was built in 1854. On Penpaled Road is a cottage, Penpaled, built in 1820 on a plot lying between two enclosed meadows. The meadows, Cae'r Beiliaid (bailiff's field) and Llain y Beiliaid (bailiff's strip) were subsequently to form part of the route of both the road and the railway. Further uphill stand a 17th-century whitewashed cottage, Ty'r Felin, and Foinavon, a yellow pebble-dashed building once owned by the Bird's Custard family. Morfin, on Tan-y-Grisiau Terrace was used as an office by David Lloyd George whilst he was practising as a solicitor. Nearby, Ty Newydd, a mid-16th century house, was originally built to house the estate bailiff. Criccieth's first council houses on the adjacent Henbont Road were built on land donated to rehouse families made homeless by the 1927 storm. Three 600-year-old cottages, originally thatched, make up Wellington Terrace. They are thought to be the oldest in the town. Ffordd Castell is within Yr Hen Dref, the original settlement. Ffordd Castell is within the original settlement, Yr Hen Dref, though most of the houses are Victorian. Ty Mawr, however, originally a smallholding and later a public house, dates from the 16th century, whilst on the opposite side of the street a long stone building, divided into three cottages, Porth yr Aur, Trefan and Cemlyn, dates from 1700. The Castle Bakery next door features a stained glass insertion above the shop window which depicts bakers at work. In the past nearby residents could bring their own dough to be baked in the ovens. By the castle entrance Gardd y Stocs, a small green, was home to the town's stocks, whilst the building that houses the castle information centre was part of the town's guildhall. The heart of the old town is Y Dref. It was here that the weekly market was held, and it was also the venue for numerous political meetings. Edward I granted lands north of the borough to the Bishop of Bangor, and it is thought that Gardd yr Esgob on Lôn Bach formed part of these. In the 19th century one of the town's abattoirs stood here. Tan y Graig, a house at the end of a long garden, dates from at least 1800. Three 16th century fishermen's cottages stand in Rock Terrace. Named Sea Winds, Ty Canol and Ty Isaf, they have 14th century foundations. On the green at West Parade stands a shelter donated by Margaret Lloyd George, the wife of the former prime minister. David Lloyd George practised as a solicitor in Criccieth, and, before the First World War, lived at Bryn Awelon. Muriau on Lôn Fel includes a group of partly 17th century farm buildings set around a square, which were converted into houses by Elizabeth Williams Ellis of Chwilog. Muriau Poethion contains an early spiral staircase going round a large inglenook fireplace. North of Ffordd Pwllheli, several mansions are along the lane, now named Lôn Fel Uchaf. Parciau was once owned by Ellis Annwyl Owen, rector of Llanystumdwy from 1837 to 1846, whilst Parciau Mawr has a notable 19th century hay barn. Bryn Awelon was the home of David Lloyd George before the First World War, and later of his daughter Megan. Nearby, on Arfonia Terrace, is Parciau Uchaf, a farmhouse dating from 1829. Y Gorlan on Ffordd Caernarfon formed part of the small estate of Cefniwrch Bach, a hunting lodge for Edward I at the time the castle was being built, and is thought to have been a tannery in medieval times. Ger y Maes, the end house on Holywell Terrace, is close to an ancient well, Ffynnon y Saint, which supplied much of the town's water. The house had a spring inside a cupboard, and ginger beer was manufactured and sold. The house at the opposite end of the terrace was a dairy, and to the south are the ruins of the former animal pound, where stray animals were held before being sold. The former National Westminster Bank on Stryd Fawr has step gables and is a duplicate of a building at Talgarth in Powys. On the south side of the street are a number of 19th century shops, including the Medical Hall, dating from 1875 and Siop Newydd, built in 1869. At the eastern end of the Esplanade stands the Morannedd Café, built in 1954 by Clough Williams-Ellis. Talhenbont Hall is a Grade II listed manor house. It was built in 1607 was once the home of William Vaughan. In 1642, the owner William Lloyd was arrested as a Royalist sympathiser as Cromwell's men took over the hall. In 1758 Talhenbont was the largest single owned piece of land in the district of Eifionydd. The estate was occupied by Sir Thomas Mostyn, the sixth baronet, from 1796. In 1884 the estate was split into sections to pay off debts that had crept up during the Napoleonic Wars. It is now operated as a holiday centre. The RNLI lifeboat station stands on Lôn Felin and was built in 1854. The crew of seventeen are all volunteers. The station has been in existence since 1853.The current lifeboat, an Atlantic 85, is named the Doris Joan. which was placed on service at the station on 6 November 2007. An Arrancia Inshore Rescue Boat Margaret and Nantw(A-76) which arrived on 16 June 2011 also operates from the station. The IRB is primarily used for work in the shallow waters of the Glaslyn and Dwyryd estuaries. Criccieth railway station is on the Cambrian Coast Line. Criccieth lies on the A497, the main road running through the southern Llŷn Peninsula from Porthmadog to Pwllheli. The B4411 runs north from Criccieth to join the A487 near Garndolbenmaen, giving access to Caernarfon to the north. Buses are operated by Arriva Buses Wales, Caelloi Motors and Express Motors, serving Bangor, Beddgelert, Caernarfon, Pen-y-Pass, Porthmadog and Pwllheli, while National Express Coaches has a service from Pwllheli to Birmingham and London. Primary education is provided by Ysgol Treferthyr on Lôn Bach, which has 131 pupils. At the last school inspection by Estyn, in 2010, 7 per cent of pupils were entitled to free school meals and over half came from homes where Welsh was the main spoken language. Welsh is the main medium of teaching, and 94% of the pupils can speak Welsh. Secondary school pupils mainly attend Ysgol Eifionydd in Porthmadog. Criccieth is a predominantly Welsh speaking community, with 64.2% of residents aged three and over being able to speak the language according to the 2011 Census. The Memorial Hall, fronting Y Maes, is a venue for concerts, dramas and other community events and the main venue during the annual Criccieth Festival. It was designed by Morris Roberts of Porthmadog in a fusion of the art deco and arts and crafts architectural styles and completed in 1925, the foundation stone having been laid in 1922 by David Lloyd George. The construction of Criccieth Library on Stryd Fawr was financed by Andrew Carnegie. A plaque inside the doorway commemorates local historian Colin Gresham. Among the services provided is free broadband access. The National Eisteddfod was held in Criccieth in 1975, and a new housing estate, Gorseddfa marks the place where the Gorsedd stones then stood. The Brynhir Arms on Stryd Fawr dates from 1631. Originally a single storey farm building, it was extended in 1840 to serve the new turnpike road. Lion Hotel, built in 1731, was where the town's councillors would retire after their meetings. The Lion Hotel, an old coaching inn, was built on Y Maes in 1731. It was here that the town's councillors would retire after their meetings in Cwrt. Several of the town's hotels, including the Marine Hotel on Min-y-Mor and the Caerwylan Hotel on Min-y-Traeth, date from the period after Porthmadog's new harbour was developed in 1811, when prosperous sea captains invested in properties where their wives could provide accommodation during the summer months. An inn had reputedly existed on the site of the George IV Hotel in 1600, but the present building on Stryd Fawr dates from 1830, shortly after the turnpike opened. In the 1920s the hotel boasted that it generated its own electricity, and, for a fee, it offered a fire and private bath in guests' rooms. Servants could stay at reduced rates when accompanying their masters. Clwb Cerdd Dwyfor stages performances at the Holiday Club Hall, ranging from traditional folk to opera and chamber music. Côr Eifionydd, a mixed voice choir, was formed in 1986 to compete in the National Eisteddfod at Porthmadog the following year. Conducted by Pat Jones, originally from Newcastle Emlyn, the choir has won a number of first prizes at the National Eisteddfod. They have toured internationally and have sung in the International Choral Festival in Paris. Actor Dyfan Dwyfor, who won the Richard Burton Award at the National Eisteddfod in 2004, is from Criccieth. It used to be the custom, on Easter Sunday morning, for keys or pins to be thrown into Ffynnon Fair as an offering to Saint Catherine. The town features in Welsh Incident, a humorous poem published in 1950 by Robert Graves, which tells of the mysterious creatures that supposedly, one Tuesday afternoon, "... came out / From the sea caves of Criccieth yonder." It is also the subject of Shipwrecked Mariners, a painting by English Romantic landscape painter Joseph Mallord William Turner; the painting uses his sketch of Criccieth Castle but, although the rock is depicted correctly, the building is a mirror image. There is a local legend that a piper named Dic, and two fiddlers named Twm and Ned, were once lured into a nearby cave by fairies. They were not seen again, but their music could still occasionally been heard coming from the cave. Griffith Jones founded a Circulating School that visited Criccieth in 1749. Out of a population of 600, the school taught 543 illiterates to read. Religion has been an important part of Criccieth's life since early days, and around 1300 St Catherine's Parish Church was built on what is thought to be the site of an early religious foundation. As the town developed so did the church, and in 1500 an extra nave was added. The church was restored in 1869 by Henry Kennedy and Gustavus O'Donoghue of Bangor It contains wooden panelling made from old box pews and a communion table dating from the 17th century. On the wall is a list of rectors stretching back to 1301. In the graveyard, the oldest stone commemorates the death in 1688 of Robert Ellis who was Groom of the Privy Chamber in Ordinarie to Catarina de Bragança, the wife of Charles II. Outside the west door is a sundial dating from 1734 with distances to ports in all directions. In 1749 St Catherine's was one of the buildings visited by Griffith Jones's Circulating School. Out of a population of 600, 543 illiterates were taught to read so that they would be able to understand the Bible. The Particular Baptists moved to a new home at Berea in 1886. The nearby Rectory was built in 1831 by John Jones, son of the then rector Owen Jones, who had offered to have the house built if his son could succeed to the position. However, Erasmus Parry, rector from 1863 to 1884, was the first to officially live there. St Deiniol's Church was completed in 1887 by the Chester architects Douglas & Fordham. Built as a chapel of ease for St Catherine's, it was financed by the Greaves family for the use of English speaking visitors as services at the parish church were held in Welsh. It eventually closed in 1988, its pipe organ being transported to Sydney in Australia. By the 19th century Wales was a predominantly nonconformist country, and this pattern was mirrored in Criccieth with the construction of a number of dissenting chapels. The Congregationalists had met on Castle Hill but 1886 saw the building of Jerusalem Congregational Chapel on Cambrian Terrace. Previously known as Capel Seion, in 1995 Capel y Traeth was renamed when the Calvinistic Methodist congregations were reunited. Capel Uchaf on Ffordd Caernarfon was built in 1791 by the Scottish Baptists. In 1841 the congregation broke away to become Particular Baptists, followers of Alexander Campbell and the Disciples of Christ. David Lloyd George's uncle often preached here and it was from the steps opposite, leading down into the Afon Cwrt, that the future prime minister was baptised. 1886 saw the Particular Baptists move to their new home at Berea on Tan-y-Grisiau Terrace, and in 1939 they joined the mainstream Baptists. Salem Methodist Chapel was built in 1901. The Calvinistic Methodists originally met at Tan y Graig on Lôn Fach but moved to Tal Sarnau, a house on the site of the Memorial Hall. From here they moved again, to a site on Stryd Fawr, rapidly outgrowing the small chapel. The neo-classical Capel Mawr was built on the same site in 1813. A second chapel, Capel y Traeth on Penpaled Road, with a notable porticoed facade, was built at a cost of £2,040 in 1895 by Owen Roberts of Porthmadog. Previously known as Capel Seion, it was renamed in 1995 when the congregation merged with that of Capel Mawr, reuniting the two congregations that had separated in 1889. Salem Methodist Chapel was built on Salem Terrace in 1901. It is now a chapel of rest. Roman Catholics worship at the Church of the Holy Spirit on Ffordd Caernarfon, whilst Criccieth Family Church meets at the Holiday Club Hall on Lôn Ednyfed. For over a hundred years community hymn singing has taken place on Sunday evenings on the small green at Abermarchnad, the site of the old market of the original fishing village. At the 2001 census 82.19 percent of the population claimed to be Christian, whilst 12.40 percent stated that they had no religion. Criccieth Tennis Club can claim to be one of the oldest clubs in existence today. It began in 1882 in the grounds of Parciau Mawr and transferred to its present site in 1884. It was first affiliated to the Lawn Tennis Association in 1896. Fifty-one open tournaments were held up to 1939, with players competing for the North Wales Championships. Notables who played here included John Boynton Priestley, the novelist, playwright and broadcaster; Frank Riseley who partnered Sydney Smith and won the Men's Double Championship at Wimbledon in 1902 and 1906; his brother Bob Riseley who was on the Wimbledon Committee of Management for many years; Dodd and Mellet of South Africa; Dorothy Round Little who was Ladies' Singles Champion at Wimbledon in 1934 and 1937 and Mixed Doubles Champion in 1934, 1935 and 1936; Commander Philip Glover, Royal Navy champion; Thelma Cazalet-Keir, the Conservative feminist politician; Alan Davies; Duncan Macaulay, who was Secretary of the All England Lawn Tennis and Croquet Club from 1946 to 1963; and Megan Lloyd George, the Liberal Party's Deputy Leader from 1949 to 1952. Golf started in Criccieth with a few holes on Caerdyni Hill, but in 1906 Criccieth Golf Club opened. It was an undulating nine-hole course on natural terrain with views of the coast and the mountains of Snowdonia. The penultimate hole was a challenging par 4 with a green 75 feet (23 m) above the tee, whilst the finishing hole was just 100 yards (91 m) long with the green 100 feet (30 m) below the tee. The club holds the distinction of having three British prime ministers, Bonar Law, David Lloyd George and Winston Churchill, play the course on the same day. It closed on New Year's Eve, 2017. The East Shore has a sandy beach, with a safe shallow area for children. The town is a popular venue for sea anglers. From the East Shore, bass, dogfish, mackerel and whiting can be caught. The Stone Jetty, in addition, is a good spot for conger, pollock and wrasse dabs, whilst bass, dogfish, mackerel, pollock and whiting can all also be found from the Marine Beach. Criccieth, Llanystumdwy and District Angling Association, formed in 1927, controls the fishing rights on 8 miles (13 km) of the Afon Dwyfor and Afon Dwyfach. Each year between 2,000 and 3,000 sea trout and 30 to 40 salmon are caught; the association runs a hatchery where between 8,000 and 10,000 sea trout are reared annually. Gloddfa Lake, a disused quarry pool on Criccieth Golf Course, is a location for coarse fishing, with catches of rudd, roach and eels. Bathing is popular, particularly on the East Shore, which is sandy and has a safe shallow area for children. At the eastern end is a rocky area with rock pools exposed at low tide. Graig Ddu (English: Black Rock) marks the boundary with Black Rock Sands. The Marine Beach to the west of the castle is pebbly. The water quality prediction is "good" and in 2009 both beaches were awarded a yellow flag seaside award. Surfing is possible at all stages of the tide, but there is a fairly exposed beach break that does not work very often. It is particularly flat in summer. Most of the surf comes from groundswells and the best swell direction is from the southwest, the beach break providing left- and right-handers. Offshore winds blow from the north-northeast. Crown green bowls is played at Criccieth Bowling Club, and there is a miniature golf course nearby. ^ a b "Census 2001". Archived from the original on 22 September 2010. Retrieved 16 August 2009. ^ "Town/electoral ward population 2011". Retrieved 14 May 2015. ^ "Obituary:Mrs J.V. Hutt. Caernarfon and Denbigh Herald, 1 February 1985. ^ Thomas Jones (ed. ), Brut y Tywysogyon. Peniarth MS. 20 (University of Wales Press, 1941), page 197. ^ D. R. Johnston (ed.). Gwaith Iolo Goch (University of Wales Press, 1988), poem II.37. ^ Geiriadur Prifysgol Cymru (University of Wales Dictionary), vol. I, p. 385. ^ "Criccieth Tourist Information Service : Frequently Asked Questions". Archived from the original on 22 March 2009. Retrieved 13 July 2009. ^ "No. 23923". The London Gazette. 29 November 1872. pp. 5706–5705. ^ "Parliamentary Intelligence". The Times. 25 February 1873. p. 6. ^ a b Local government in England and Wales: A Guide to the New System. London: HMSO. 1974. pp. 103, 177. ISBN 0-11-750847-0. ^ "RNLI: Criccieth Lifeboat Station". Archived from the original on 9 May 2014. Retrieved 16 February 2016. ^ Station, Criccieth Lifeboat. "Latest Services, Exercise Dates and News - Criccieth Lifeboat Station Website". www.cricciethlifeboat.org.uk. Retrieved 22 April 2016. ^ "My Local School". mylocalschool.wales.gov.uk. Retrieved 13 April 2016. ^ "2011 Census results by Community". Welsh Language Commissioner. Retrieved 13 April 2016. ^ Ash, Russell (1973). Folklore, Myths and Legends of Britain. Reader's Digest Association Limited. p. 384. ISBN 9780340165973. ^ "The Incorporated Church Building Society : Church Plans Online : St Catherine". Archived from the original on 28 September 2011. Retrieved 5 July 2009. ^ Hubbard, Edward (1991). The Work of John Douglas. London: Victorian Society. ISBN 0-901657-16-6. ^ "Angling Wales". Archived from the original on 21 October 2001. Retrieved 17 April 2013. "Criccieth" . Encyclopædia Britannica. 7 (11th ed.). 1911. Wikimedia Commons has media related to Criccieth. Wikivoyage has a travel guide for Criccieth.